I’d be happy to forward one of the Tombow VP’s for your review if you’d like to send contact info. I’m enjoying the broad spectrum review of these unusual pencils. Thanks. The Faber-Castell green is just too funny in this pencil. I use this type of pencil to make notes in books that I’m going to review. I really like the Musgrave thin. The only other ones I have are Prismacolor. I could offer a Lyra Rembrandt Rot-Blau for your collection and review. Harry and Frank, I appreciate the pencil offers, but I fear that shipping a single pencil internationally would be too much trouble. I do appreciate it – it is a very nice offer. And I suspect Gunther will soon be updating his excellent list! Thank you for the review, the great pictures and the kind words. – I have just added some names to the list but I don’t have the time to take photos at the moment. In Canada, this type of pencil is (in 2008) an extreme specialty. All nine of these pencils were provided by an overseas pencil friend or purchased via mail order. 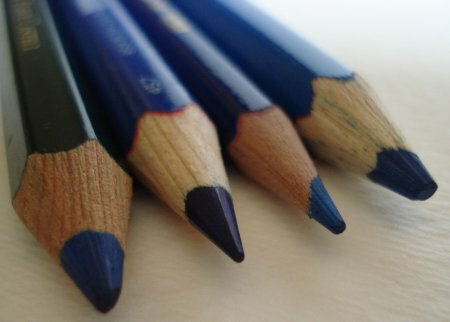 Are red and blue pencils regularly available in Argentina? I am not familiar with most of the brands you mention. 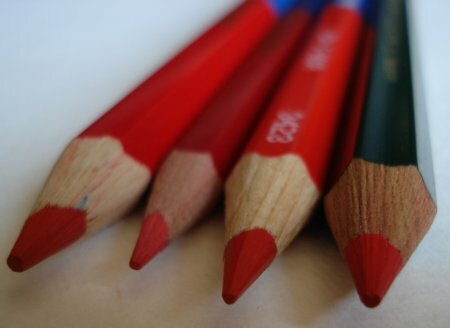 Hi, yes, red and blue pencils are available in drafting shops, I’m an architect and I use a lot for make corrections and notes on the plans, I use a lot the pax pencil (from chile) this is the most common red/blue pencil. I forget the faber-castell 737 (from Brazil) this are a available in most pencils/books shops. Thanks for this information. It is most appreciated! 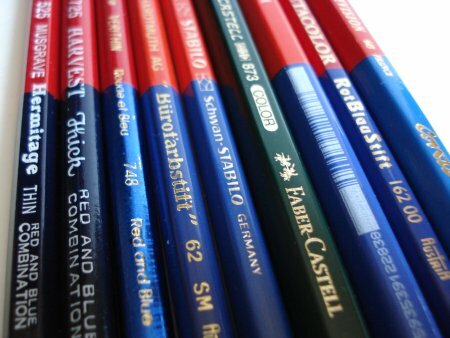 Sorry for (mis-)using this discussion for my private wishes but if anyone is willing to send me some red and blue pencils for my collection I would be very happy. Of course I pay for the pencils as well as for the shipping (PayPal). Any offers are much appreciated! My email is schmidt AT stdk DOT de. 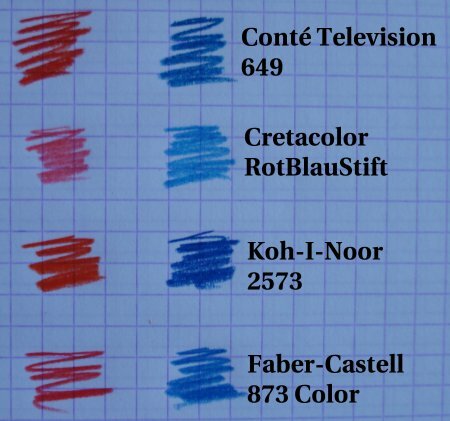 I’ve got both the Conté Television 649 and the Faber-Castell Castell 873, I prefer the Conté pencil for marking on fine paper, the soft lead doesn’t tear the paper and the shades of red and blue are light enough that I see the words that I’ve shaded very well. I’d like to purchase more of them, I got them while I was on a trip to France. < ...> merci de votre compréhension De Leeuw Daniel. thank you for your understanding of. comment commander le crayon conté télévision 649 ? Are these colored pencils the same as standard color pencils. Is the formula dry and hard like a Derwent Studio or waxy and soft, like standard Prismacolor. Just curious. i’ve been told that thoose pencils are told “TELEVISION” beccause their releise date is the same than the Télévision in france. A nice story. Hard to find now, as far as i know !